Blue_Large_Paper_Booklet_Envelopes is rated 4.8 out of 5 by 4. Rated 5 out of 5 by jbrown from Great Quality Used these envelopes for a mailing that included a 20 page Impact Report. Rated 5 out of 5 by cececville from Rich deep navy! We just rebranded and needed a Navy envelope for billings and contract mailings. These are really nice and love the booklet side opening. Rated 5 out of 5 by TammyR from Exactly as ordered! JAM came highly recommended from one of my vendors as a good resource for the colored envelopes we were looking for. I could spend hours on this website shopping!!! Found a promo I could use, and my order was shipped asap. Will definitely be using again, and again in the future for personal as well as business. Are these dark blue envelopes in 9X12 available in the Brier Creek store? The only physical store we have is in New York City. Otherwise, you can order them from our website. Please let us know if you have any additional questions. Can you have the envelopes custom printed with our return address? What is the Pantone color for the Navy Blue? The pantone color for Navy Blue is 296U. can I get my logo on these envelopes? For direct mailing of booklets, brochures, resumes, or other significant documents, Blue Large Paper Booklet Envelopes are an appealing choice. A pop of blue in the mail will be a pleasant surprise, especially in a sea of white envelopes! And with the large size, you'll be able to fit a standard size piece of paper will no crinkles, tears, bends, or rips! A great color combined with the perfect size - what more is there? Blue Large Paper Booklet Envelopes are available in an array of shades! 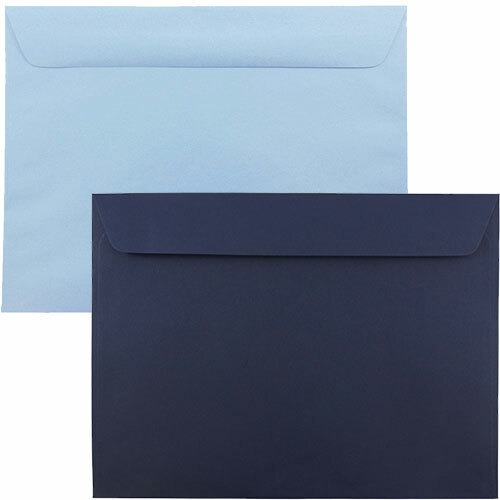 Choose from our Brite Hue Envelope collection featuring the classic blue or a cool sea blue. Or go for our Translucent Envelope for a semi see-through look, which makes for a great overlay for an oversized invitation. From a vibrant primary blue to a subtle ocean blue, we really do have it all. Blue Booklet Envelopes are available in two sizes: 9 x 12 Booklet and 9 1/2 x 12 5/8 Booklet. Click around to see what colors go with what sizes!